Morandi's activity as a printmaker was not a mere supplement to painting, a means of additional income for the established artist: etching played a significant part in his artistic practice from the outset. 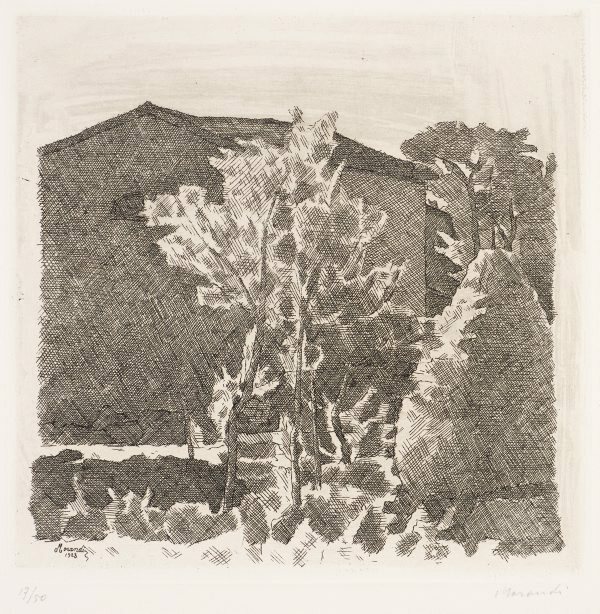 Inspired by masters of the medium, Rembrandt and Goya, whom he profoundly admired, Morandi began making prints in 1911, when still a student at the Academy of Fine Arts in Bologna. Unfortunately, none of his earliest etchings have survived. Although entirely self-taught as a printmaker, Morandi held the Chair in Printmaking at the Academy of Fine Arts in Bologna from 1930 until 1956. Highly methodical in his use of the etched line, Morandi created shapes, volume and space by varying the density of his marks, hatching and cross-hatching to avoid the use of a descriptive outline. The resulting system of shaded surfaces is contrasted with areas completely untouched by the needle – bianco assoluto, ‘absolute white’, as Morandi called it – creating a highly atmospheric chiaroscuro effect. Signed and dated l.l., inscribed on plate, "Morandi/ 1928". Signed l.l., pencil "Morandi". Giorgio Morandi: the dimension of inner space , Sydney, 1997, p 87, no 54, illus p 87. Unknown, L’opera grafica di Giorgio Morandi , Turin, 1964, no 44.